Healthy eating is easier than you think so get started today! The sweet buzzing of the vending machine at the office calls your name. You have cream-filled cookies gazing lovingly into your eyes, while the cheddar crackers and chocolate candies are whispering sweet nothings into your ear. Then your conscience speaks up and says, “Don’t forget to eat your apple..” Face it. Eating healthy isn’t what it’s cracked up to be. Or, is it? 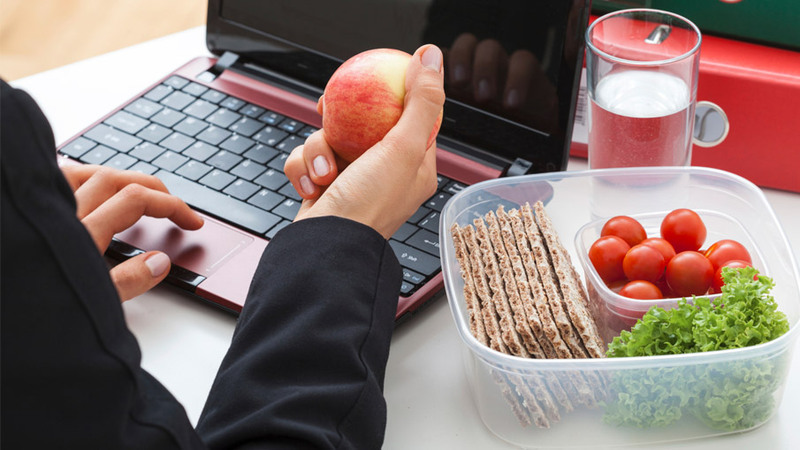 Wellworks For You wants you to want to enjoy eating healthy… so here are a some tips on how to eat healthy at work. Prep your lunches the Sunday before your work week starts so if you need to cook, you have time. Most people prepare 5 days of lunch and use plastic containers to store their food in. This helps you substitute high-fat foods for low fat ones. Substitute foods that are high in fat and carbs with low fat and low carbs. For example, whole wheat pasta instead of regular pasta, broth or water instead of oil and butter. Bring healthy snacks to work such as snap peas, carrots, celery and peanut butter instead of chips and cookies. Purchase family size packages of deli meats or fish. You can switch things up by using them in sandwiches, salads or stir fry’s and choosing different spices and dressings to go with them. Serve your meals on smaller plates to reduce your chance of overeating. Stay away from processed foods. It may not sound easy, but it really is. Those vending machines are now off limits and you have now introduced yourself to a step in the right direction. Less coffee and more water goes a long way. Coffee is not only addictive, but it is common for people to combine this delicacy with lots of milk and sugar. This milk and sugar can add major pounds, not to mention it dehydrates you. Stick with water to purify the impurities in your system and keep you healthy. Get away from your desk! It may seem simple to those who don’t have desk jobs, but those who do find it very hard to get away from their job during lunch. A common excuse is that it’s just too busy. According to the American Dietician Association, eating at your desk encourages mindless eating and overeating. Lunchtime is perfect to find a beautiful park to sit at and enjoy your meal, visit your company cafeteria or have a lunch date with a good friend. Request a health coaching program that can provide nutritional counseling to show each person individually how to eat healthy at work. According to the CDC, all it takes is good nutrition to lower your risk of chronic conditions like heart disease, stroke, diabetes, some cancers and osteoporosis. For more information on how Wellworks For You can show you how to eat healthy at work, give us a call at 800-425-4657.